I am so excited to share this recipe with you guys! Both the hubs and I approve and that says a lot considering hubby loves his whole wheat pasta! In the past, I would have normally made this dish with pasta, but spaghetti squash works really well for this dish. If you haven't tried spaghetti squash yet, then you don't know what you are missing! It has a nice slight crunch and packed with nutrients, but it does resemble spaghetti noodles, hence the name, "spaghetti" squash. I don't think you will miss pasta, once you try this dish. If you need a tutorial on how to prepare spaghetti squash using a microwave, you can go HERE. I also substituted Greek yogurt for sour cream which is often found with Mexican dishes. Greek yogurt is so versatile because it can be a healthier substitute for sour cream, mayonnaise and even butter! It helps make dishes thick and creamy without adding all the calories. You gotta love that! This casserole does freeze well so that is a plus in my book. You got to love those make ahead freezer meals, especially for those busy week nights! It will definitely be a meal found in my freezer. Yummy comfort food and the perfect dish if you are craving Mexican! Substituting Greek yogurt for sour cream helps lighten this dish without skimping on flavor! The sauce is a blend of Greek yogurt, enchilada sauce, with a little bit of chili powder to give it extra kick. Adding the chopped green pepper while the ground beef is cooking softens them up some and gives the beef more flavor. Rotel tomatoes also help add more zest to the meat with it's perfect blend of tomatoes, green chili peppers and spices. Love this stuff in my Mexican dishes. Drain all the fat and liquids from the eat using a strainer. Return the meat back to the skillet and add the yummy sauce you prepared earlier. All the lumps from the cream cheese that were in the sauce previously, disappear and gives the sauce becomes smooth. Next add the spaghetti squash and give it a good stir. Top with cheese and bake until the cheese is melted. Delicious! In a medium sized bowl, combine enchilada sauce, Greek yogurt, cream cheese, and chili powder. Stir until combined. It is okay if the mixture is a little lumpy from the cream cheese. The cream cheese will eventually melt when combined with the warm ground beef and spaghetti squash. Set aside. 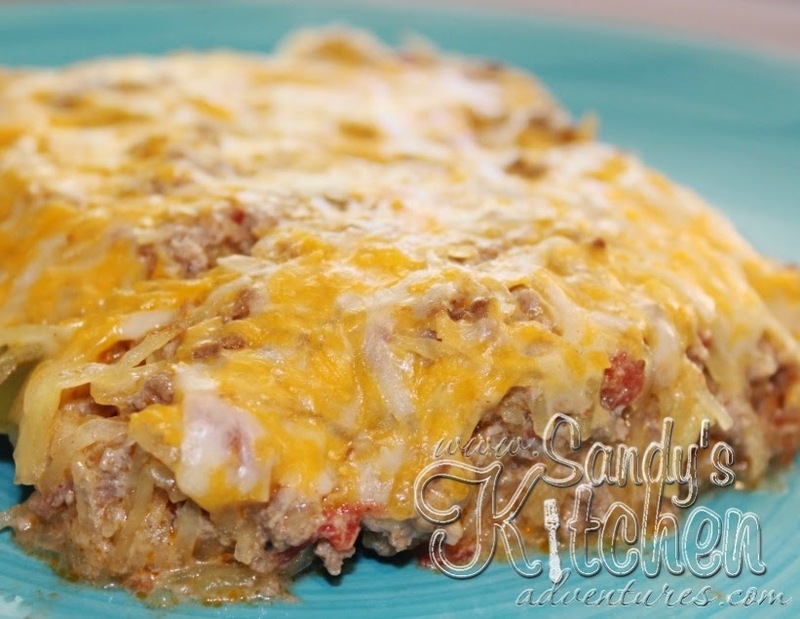 Over medium high heat, add ground beef, chopped green peppers, and can of Rotel tomatoes to a large skillet. Cook until ground beef is no longer pink and green pepper is tender. Drain meat of all fat and liquid. Add spaghetti squash and enchilada sauce to the ground beef mixture. Stir until everything is combined. Pour the mixture into a casserole dish. I used a deep 9 inch square casserole dish. Top with Mexican style cheese. Bake for about 25 minutes or until cheese is melted.